Lil Number Chef - I'm The Chef Too! It’s as easy as 1, 2, 3! Children will learn how to count and identify numbers while preparing, cooking, and snacking their way though number concepts. 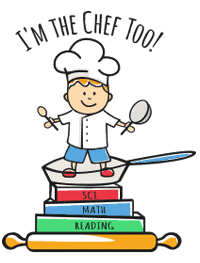 Little chefs will problem solve and use critical thinking in order to cook up mathematical creations in the kitchen! Who knew math could be so delicious?